Italian astronomers have conducted an X-ray analysis of the accreting supermassive black hole in the broad line radio galaxy PKS 2251+11 as part of a study aimed at investigating the galaxy's nuclear environment. The new research, presented in a paper published March 15 on arXiv.org, could improve the understanding of active galactic nuclei. Radio galaxies, which have active galactic nuclei (AGN), emit huge levels of radio waves from their central cores. Black holes at the center of these galaxies are accreting gas and dust, generating high-energy jets visible in radio wavelengths, which accelerate electrically charged particles to high velocities. In AGNs, the accreting material is reprocessed by the surrounding nuclear environment, so that these objects are observable at all wavelengths, from radio to gamma-rays. However, the structure of the nuclear environment still baffles scientists, and more studies, especially in the X-ray wavelength, are required in order resolve any uncertainties regarding this subject. Such observations could be a powerful tool for the investigation of the accretion-ejection physics in the neighborhood of supermassive black holes in AGNs. Broad-line radio galaxies (BLRGs), like PKS 2251+11 at a redshift of approximately 0.33, are excellent targets for high-quality X-ray observations due to the fact that they have the highest X-ray fluxes in the radio-loud population of AGNs. Therefore, high X-ray luminosity and the relative proximity of PKS 2251+11 make it an ideal candidate for a detailed analysis of the accretion regions in radio galaxies. So a group of astronomers led by Samuele Ronchini of Gran Sasso Science Institute in Italy has used ESA's XMM-Newton space telescope to conduct spectral and timing analysis of PKS 2251+11 in the X-ray band in order to get more insight into the structure, kinematics and physical state of the nuclear environment in this galaxy. "Through the X-ray analysis of an observation performed with the XMM-Newton observatory, we have obtained novel information about the geometry, the kinematics and the physical state of the regions surrounding the accreting SMBH [supermassive black hole] at the center of the BLRG PKS 2251+11," the astronomers wrote in the paper. The observations found that the X-ray source in PKS 2251+11 is partially covered by the ionized absorbing medium. This absorber is most likely clumpy and could be composed by distinct clouds with a covering factor of around 90 percent. 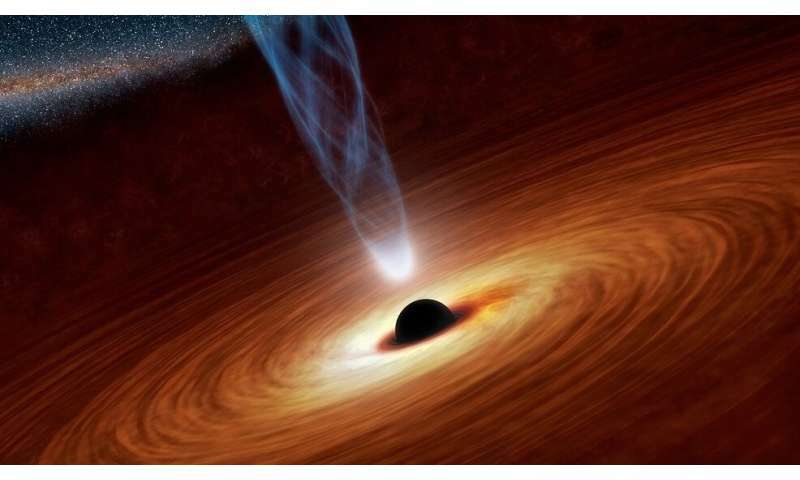 The distance of the absorbing medium from the supermassive black hole was estimated to be around 0.33 light years, however, it cannot be excluded that the absorber is located much farther, in the zone of the dusty torus. The researchers also detected an iron K-alpha emission line at 6.4 keV. The intensity of this emission showcases variability on timescales of hours. The scientists added that besides this feature, no other spectral parameters exhibit significant variability during the observational campaign. In concluding remarks, the authors of the paper noted that many questions remain about PKS 2251+11, like the origin of its jet. This is mainly due to the lack of information regarding the state of the very innermost disk and the spin of the galaxy's SMBH. However, the researchers note that the X-ray properties indicate that PKS 2251+11 does not differ significantly from the non-jetted AGNs.